Some FGS users with multiple, non-integrated systems use FGS to collect data from each system. The FGS database ties it all together and provides the planners with all of the information they need in one place. 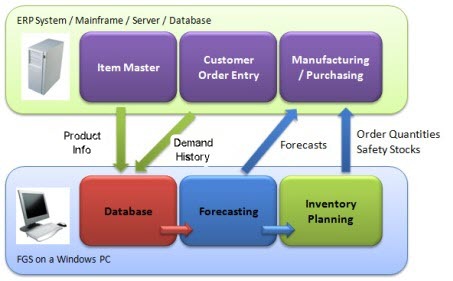 If you already have an MRP or replenishment planning system, FGS generates forecasts and inventory targets. 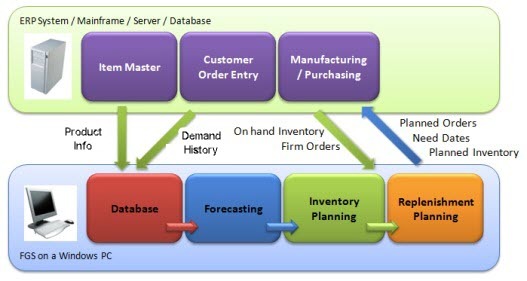 Demand History: Demand for a part at a location. Data may be "bucketed" to daily, weekly, monthly, etc. periods or data may be at the transaction level. We recommend transactions so that FGS can flexibly summarize the demand by selectable periods. You can also do statistical analyses to identify outlier transactions. Product Information: Part number, description, lead time, cost, purchasing or manufacturing data, and any other data to describe or classify your data. Forecasts: These may be weekly, daily, monthly, etc., in any unit of measure or format that your system requires. Order quantities: FGS computes recommended replenishment quantities (EOQ or adjusted order quantity). Safety stocks: These are calculated to provide the desired service levels in the inventory module. Reorder points: If you don't have an MRP system you can upload reorder points (which are a combination of forecast and safety stock). Other information such as ABC inventory classifications, and any calculated values. If you do not have an MRP system and wish to reap the benefits of time-phased replenishment, the Replenishment Planning Module is for you. Even if you run MRP this module can provide significant benefits, especially at the finished goods level. On hand inventory quantities, allocations, quality holds, etc. If you are replenishing at the warehouse level, this would include that inventory as well. Firm replenishment orders such as manufacturing orders, purchase orders, and work orders. Additional information about vendors, replenishment policies, etc., can be helpful. Suggested planned orders to be firmed or shared with suppliers for long term planning. Other information such as work center capacity requirements, projected weekly inventory levels, cash flows, etc. If you have complex distribution requirements FGS can plan your warehouse transfers.